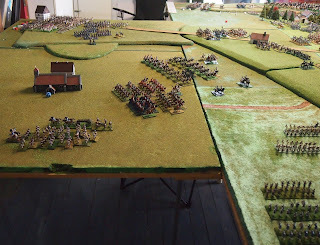 The third instalment of our bicentennial game of Waterloo, which we played back on 19th July, saw the arrival of the Prussians, hampered by attacks from Durutte's division support by French heavy and guard light cavalry, and a developing 'crisis' on the Anglo-Allied right and centre. 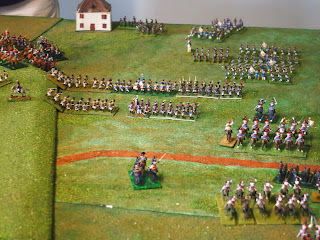 Read on for the photo-report of how this came to pass, setting the stage for the dramatic fourth and final part. 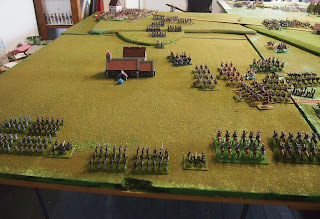 (If you have not seem them previously, or would like a reminder of how the game progressed in the first two parts, you may like to see the reports of part one and part two that are posted elsewhere on this blog). We picked up the game with the French attack on the Anglo-Allied right and centre-right in full swing (seen here in the distance, La Haie Sainte in middle distance). 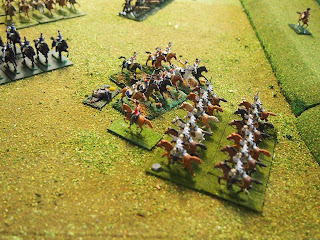 Meanwhile the guard and auxiliary artillery de la marine horse guns have combined to pressure the left-centre, with flank support from Delort's frustrated cuirassiers (at the lack of targets to charge). 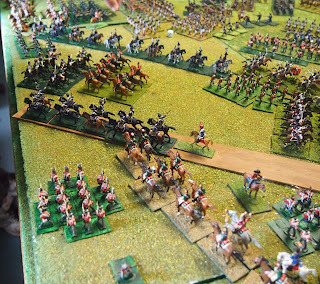 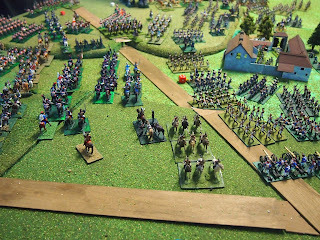 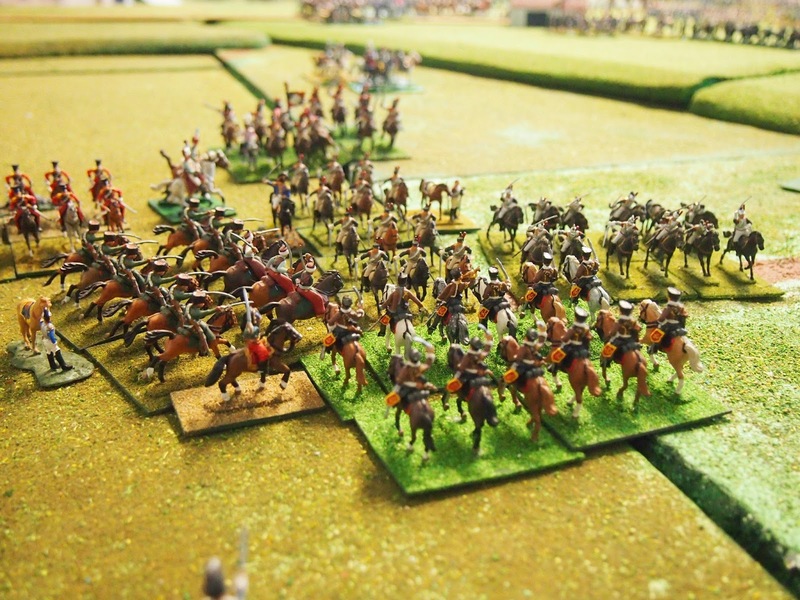 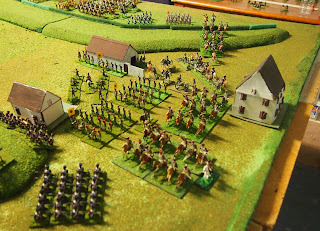 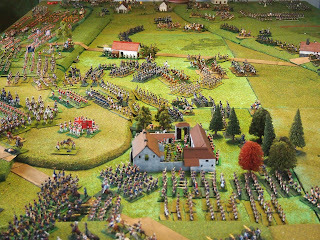 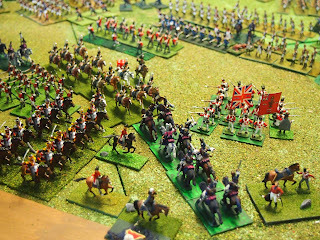 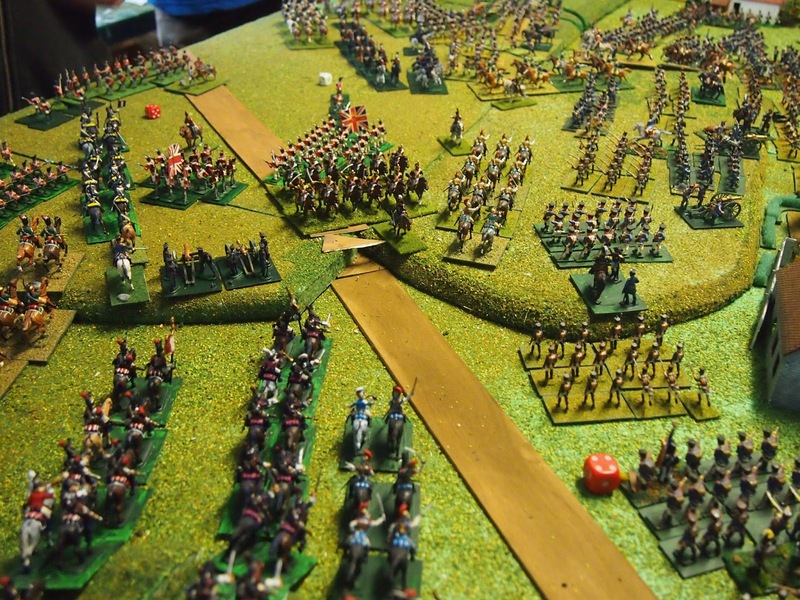 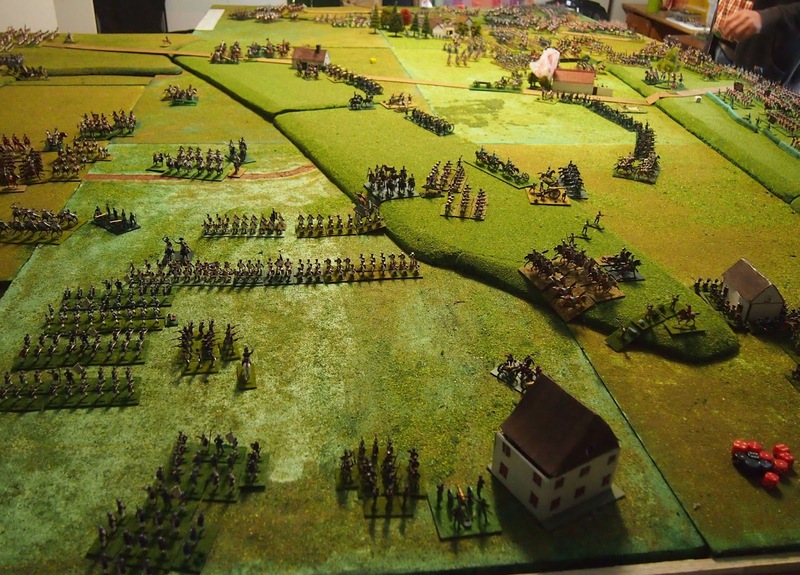 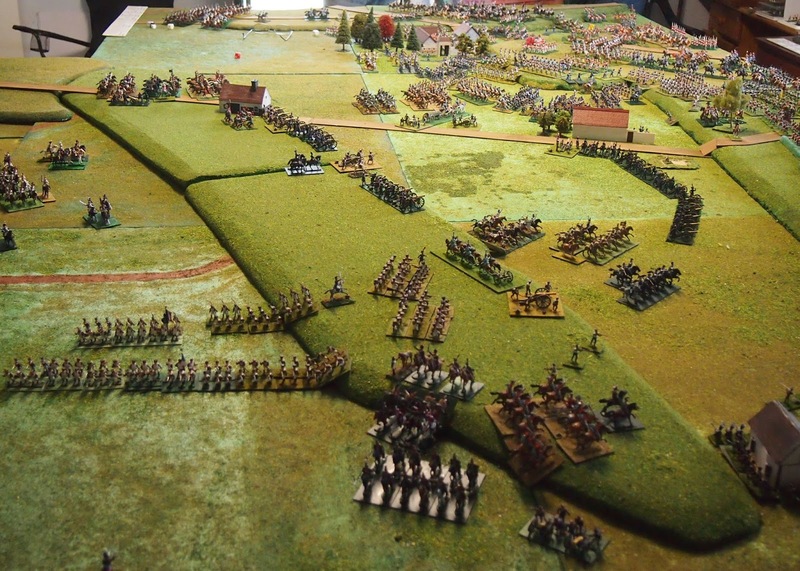 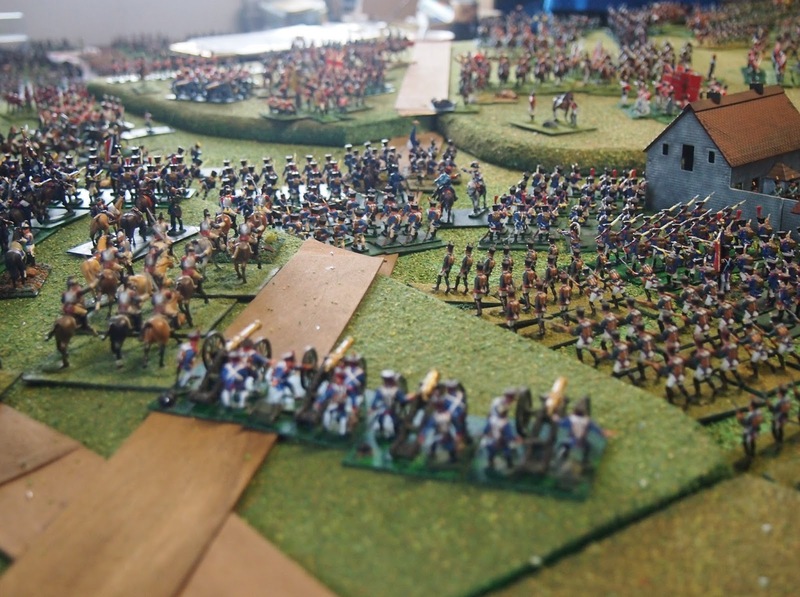 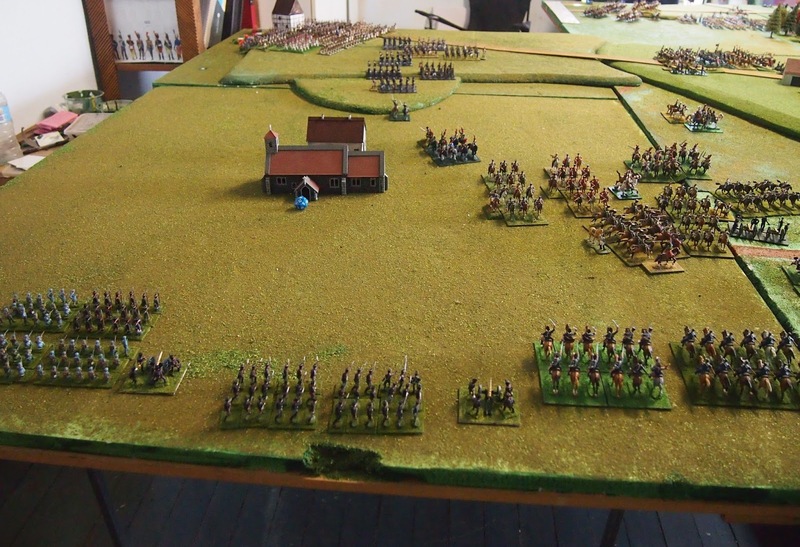 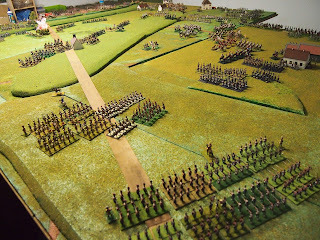 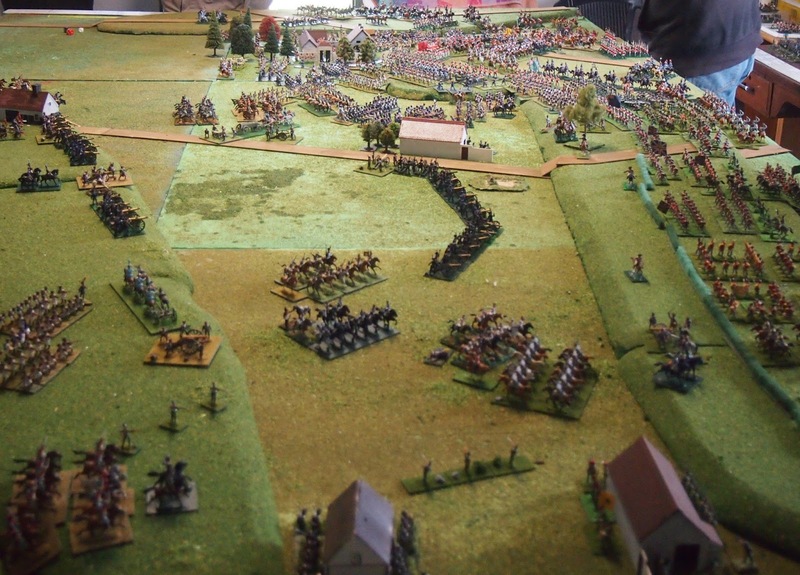 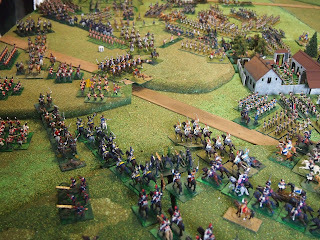 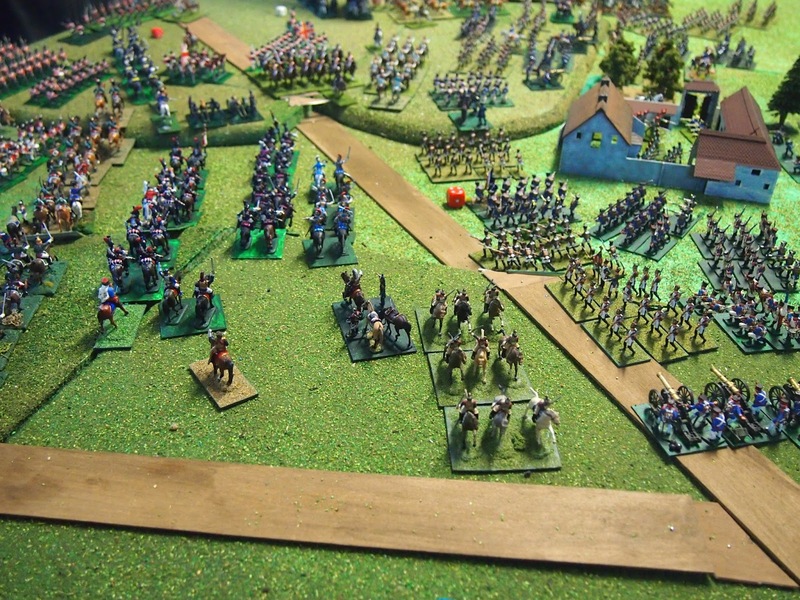 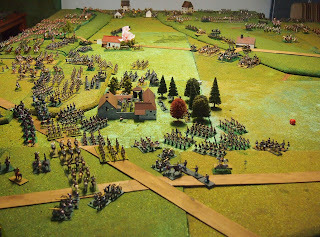 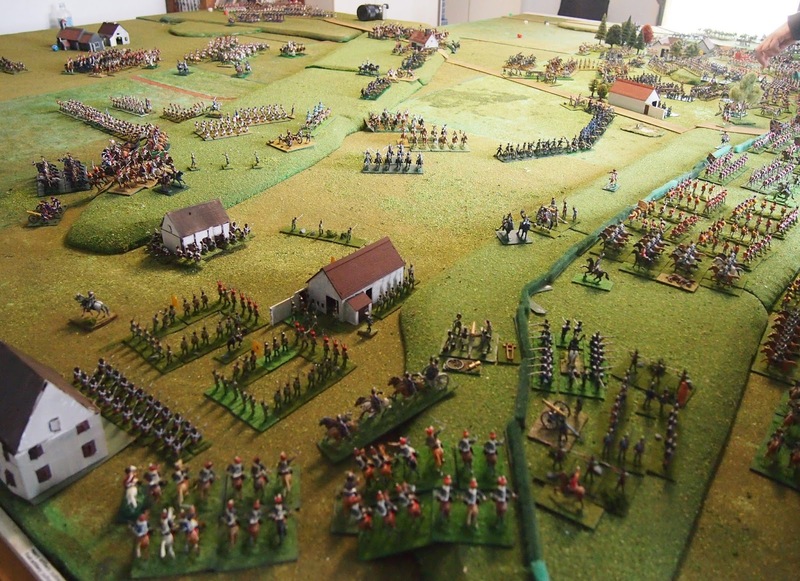 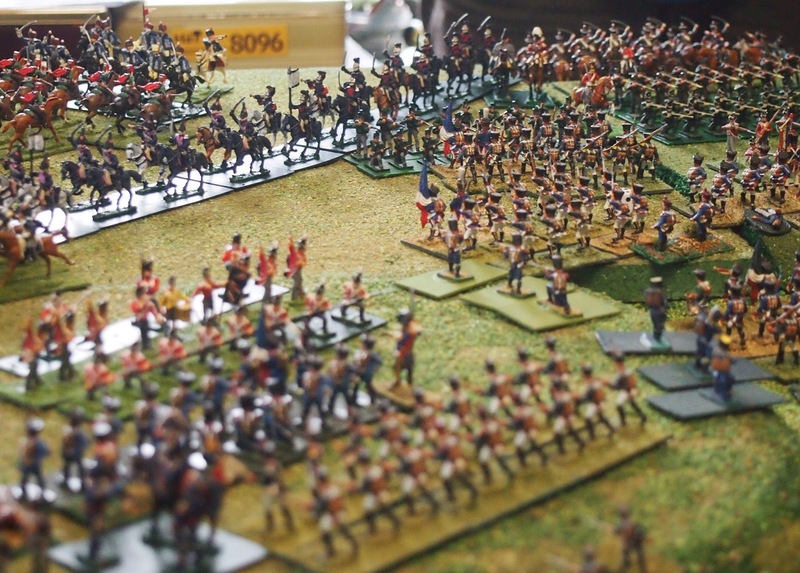 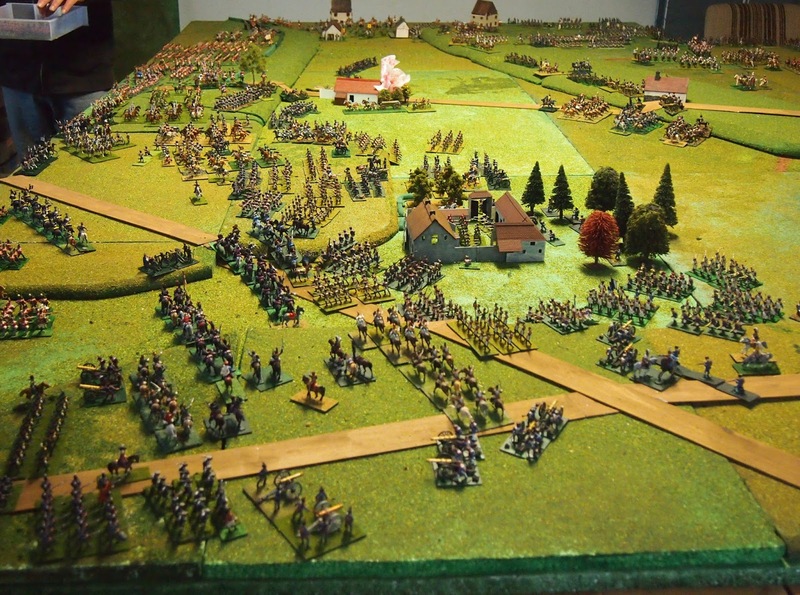 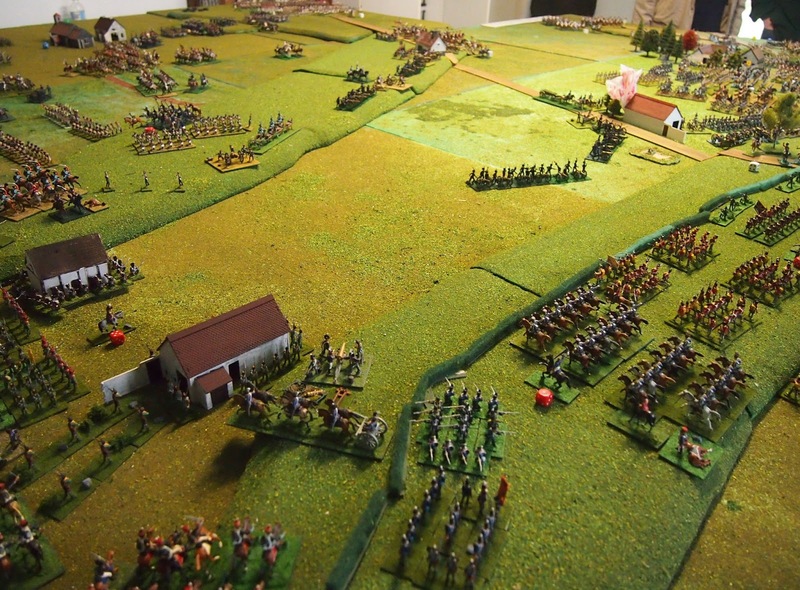 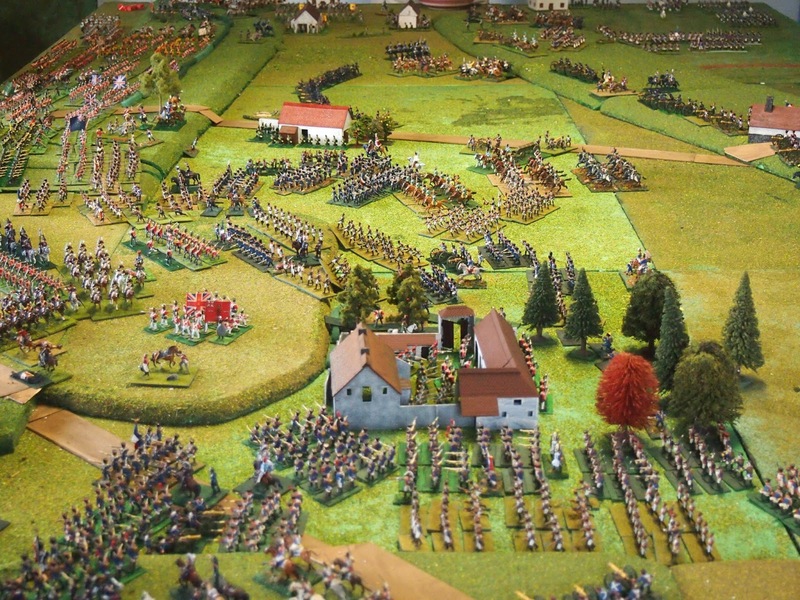 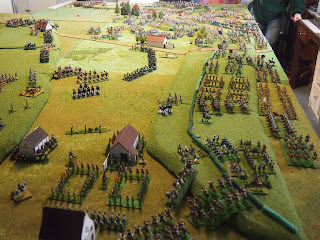 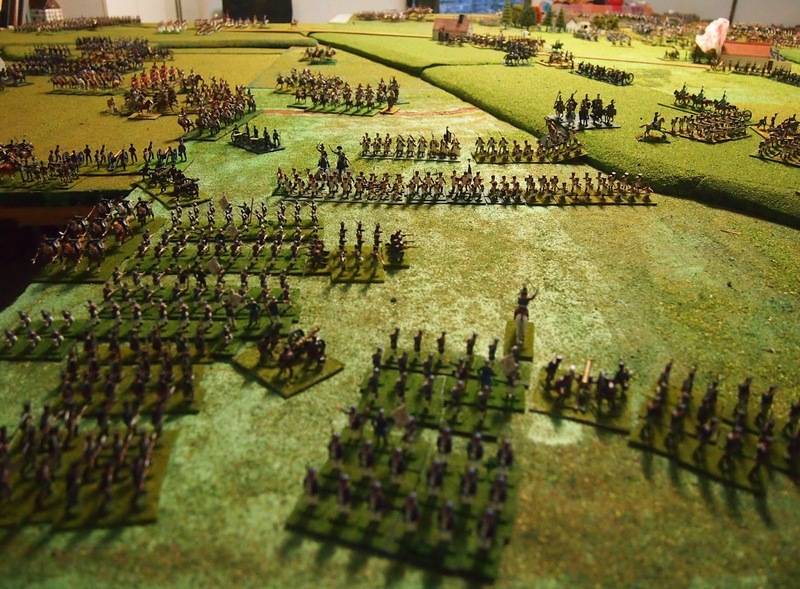 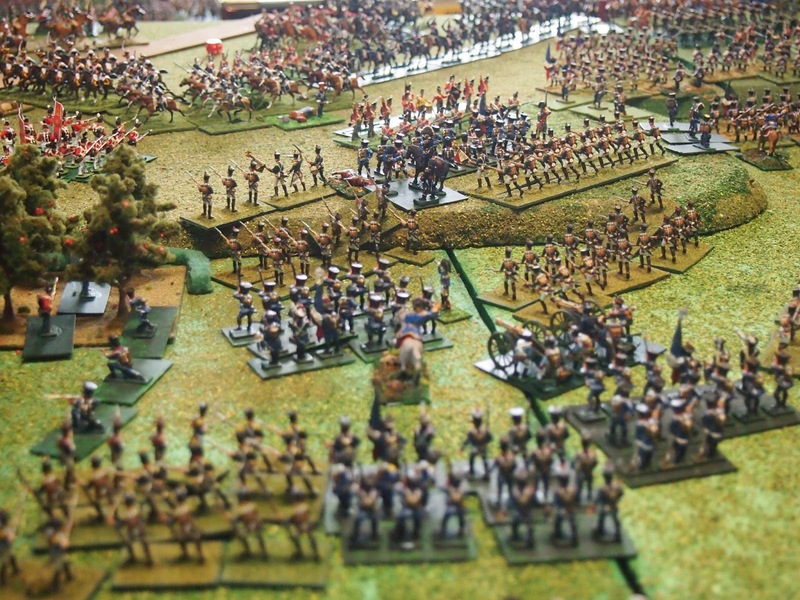 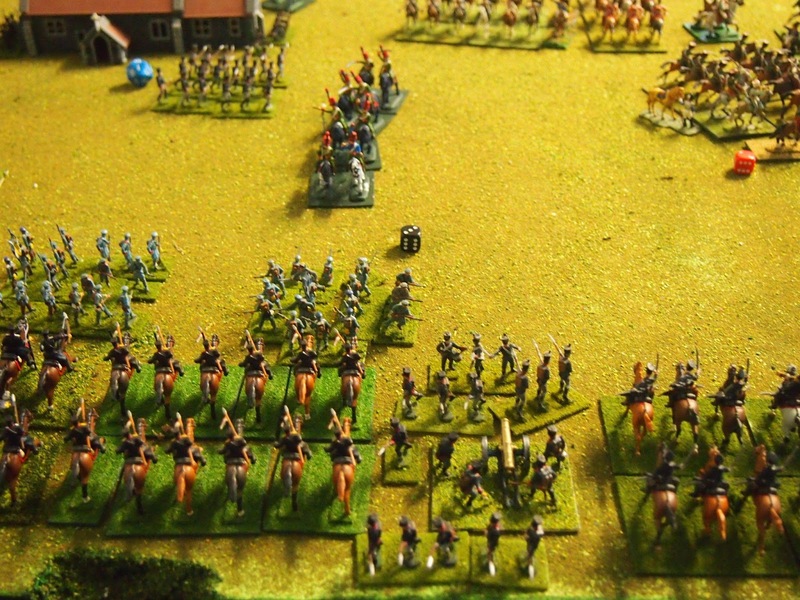 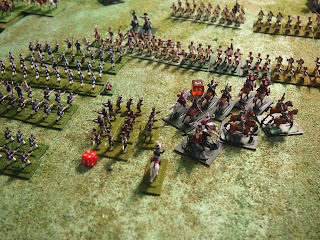 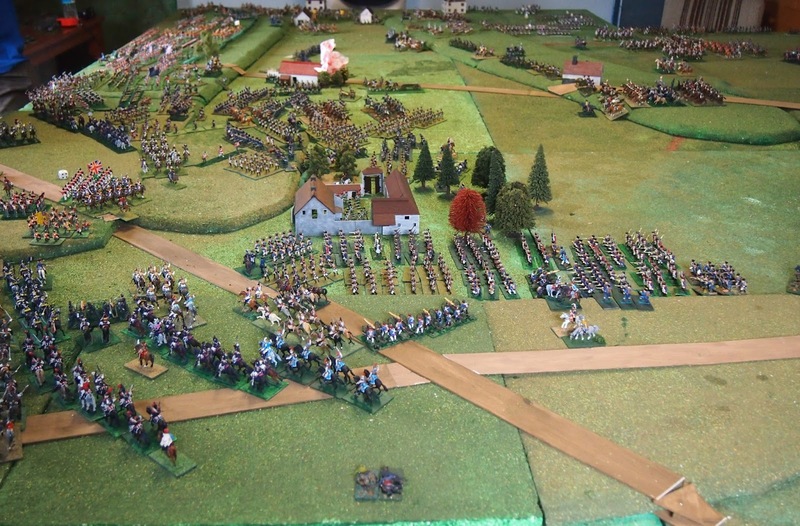 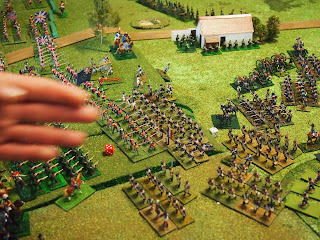 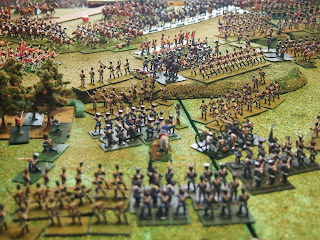 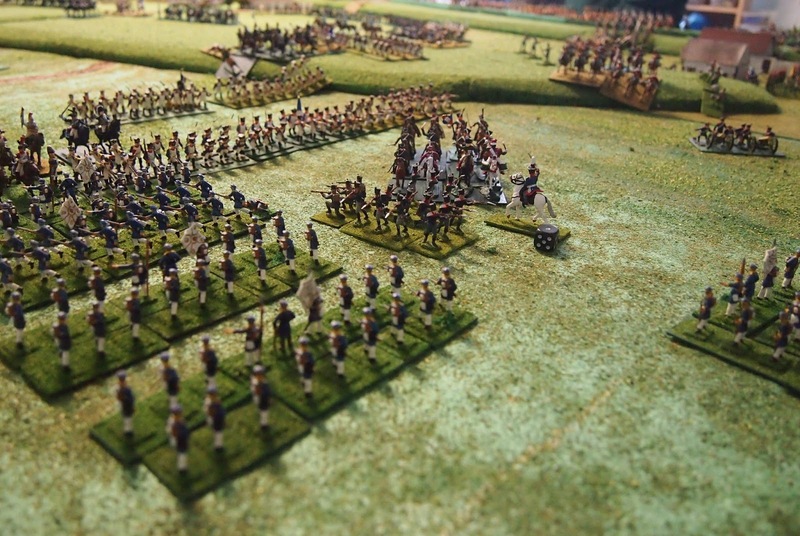 In the bottom left of the picture Durutte's infantry and Jacquinot's cavalry hold the French right as the Prussians arrive on their flank (out of picture). 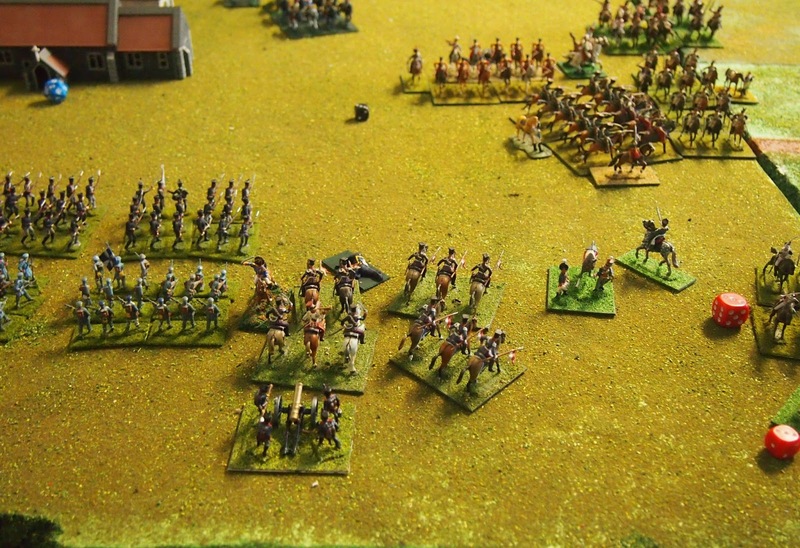 Jacquinot sent his 3e chasseurs à cheval (heavily disguised as the 7e) to attack von Lothin's lead unit. 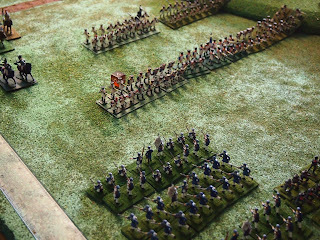 The latter, failed to form square and were 'scattered to the winds'. ... but the French veteran heavy cavalry (they were the first unit of French cav. 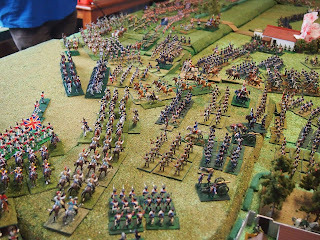 that I ever painted) were equal to the task. We have noted often that throwing a one is not a good tactic, with the exceptions of forming square, rallying a units and assessing the fate of staff officers! 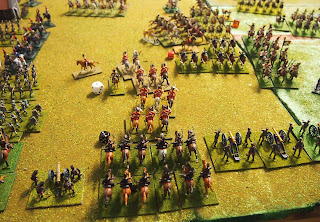 Discretion was the better part of valour and Delort's men rallied back so as to be better prepared for the developing 'left hook' from the British cavalry (foreground). Back on the Anglo-Allied left Wellington was desperately trying to 'plug' the hole in his line, now sending Trip's Dutch-Belgian heavies into the fray. which continued to be held resolutely by the 2/Coldstream Guards and 1/1st Nassau. 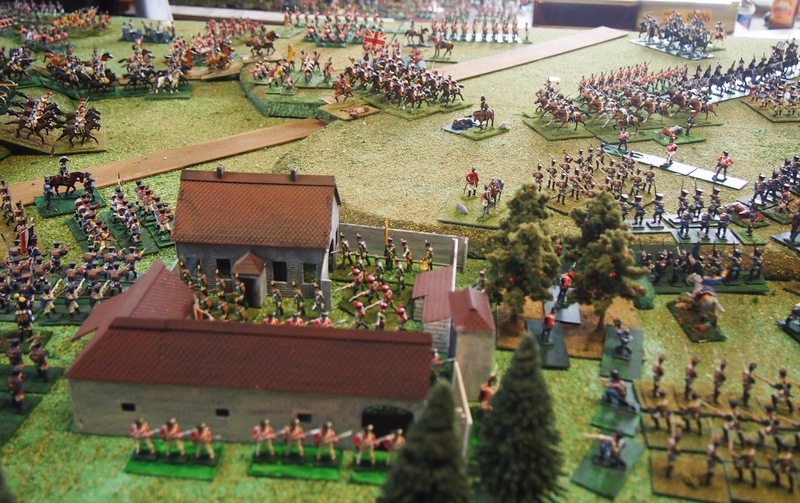 Meanwhile, between the chateau and La Haie Sainte, Lobau's divisions along with Quiot's 1st Division of I Corps were pushing the advantage created by II Corps and III Cavalry Corps' diversion. 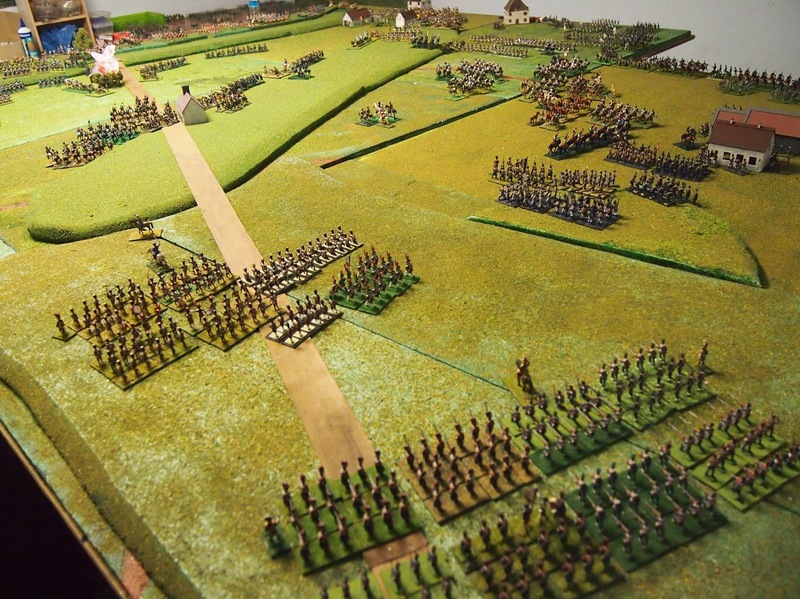 The overall situation at this end of the battlefield is shown by this view across the battlefield from the 'west'. 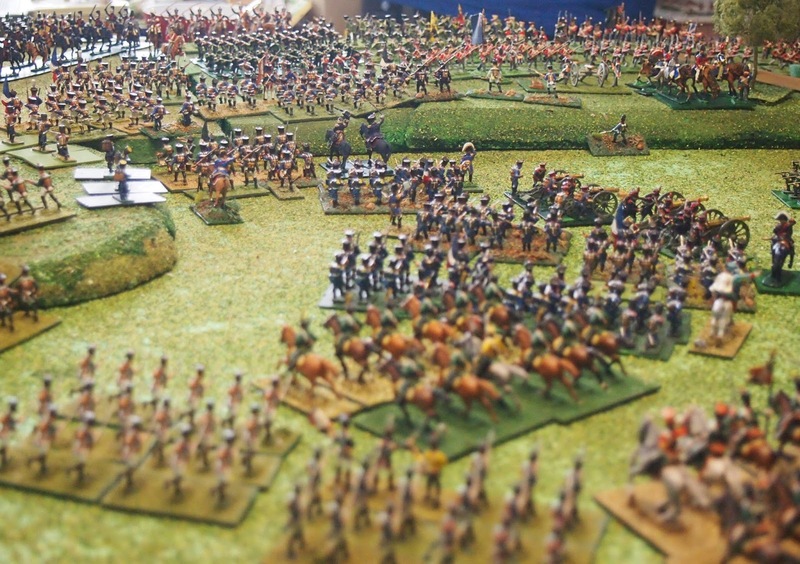 as well as the Prince of Orange's left hook' mentioned above. 'Disaster' for the French! 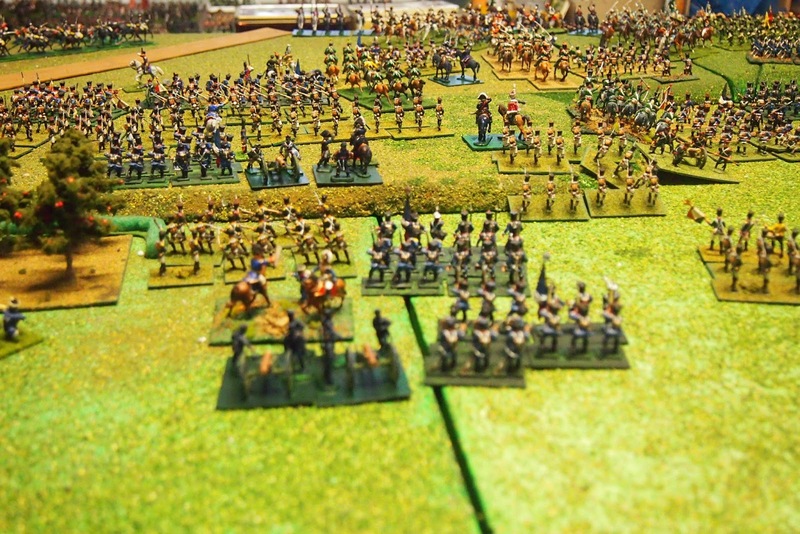 Jérôme's division of Reille's corps retreated en-masse (having failed morale at 1/3 losses). 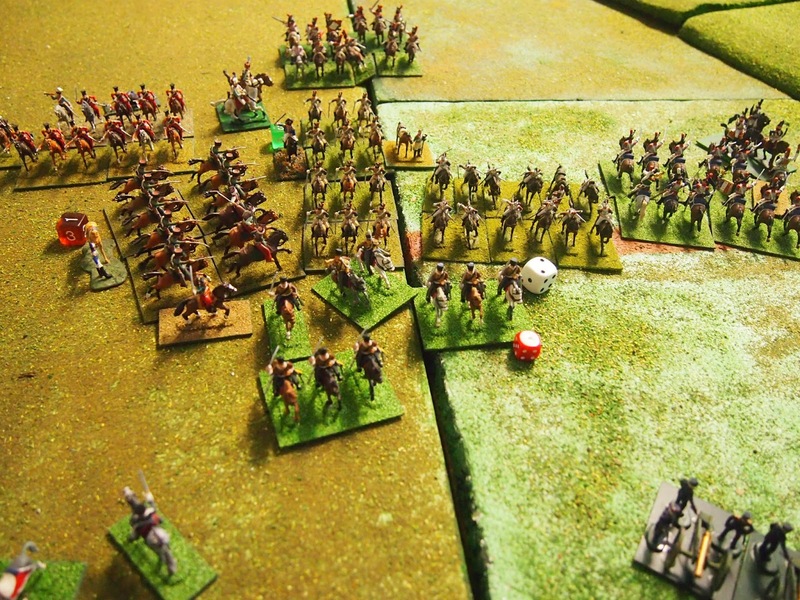 "The tide is turning!" 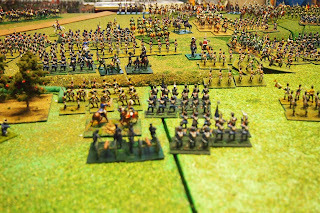 concluded the Allied commanders. 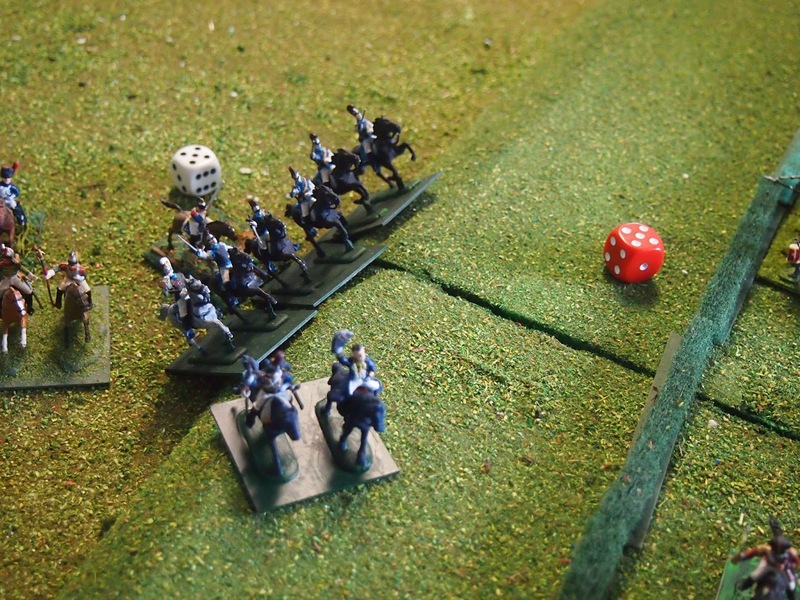 Perhaps it was as von Hiller's 16th Brigade smashed into the disordered ranks of Marcognet's retreating men, easily defeating them. 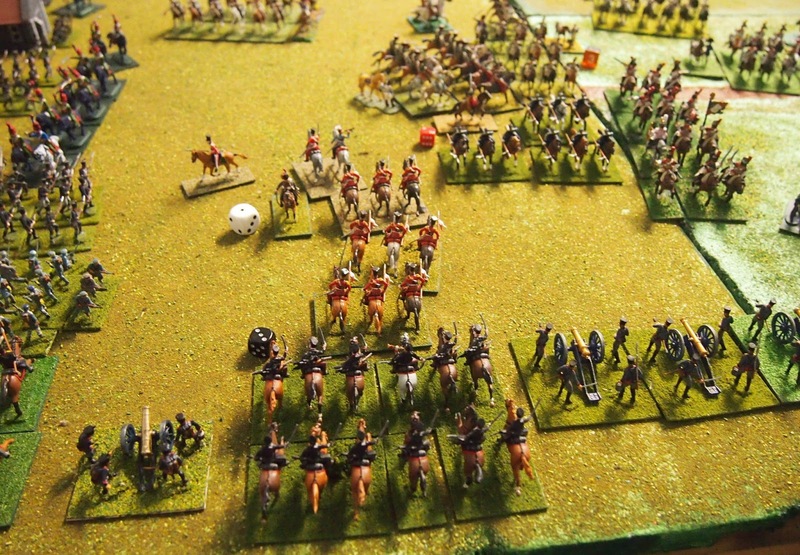 Ah, but there was plenty of fight left in the Emperor's men yet, Delort's 6e cuirassiers (heavily disguised) easily accounted for another British foot battery on the forward side of the ridge. 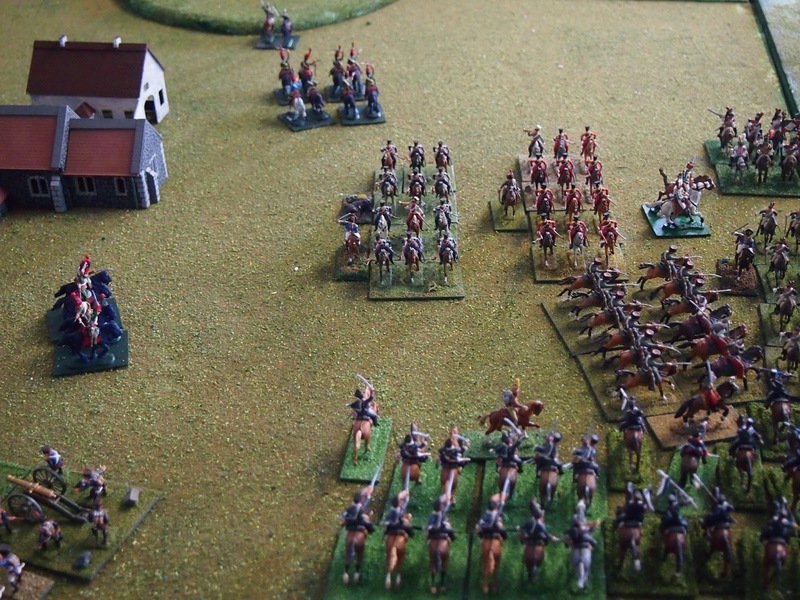 but came off second best when the "cherished children" were supported by Wathier's 4e cuirassiers. 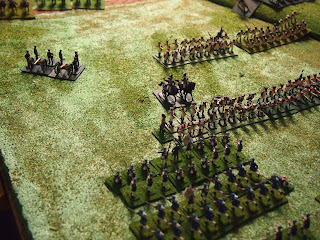 To the 'north' of this cavalry duel, Durutte's infantry fought off von Losthin's 1/18th Infantry Regiment (6th Reserve). 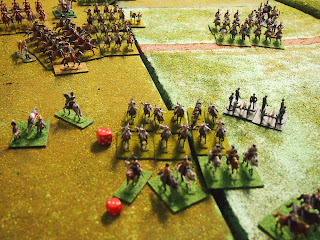 Only to be driven off as the latter coolly formed square in the face of the on-coming horsemen. A one can win, if the other side throws one too and you have the advantage of formation! For the time being the French right was stabilised, but many more Prussians were advancing to the assault. 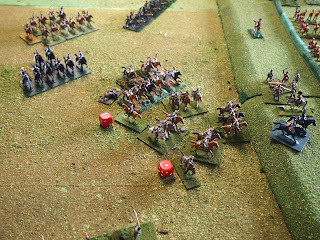 Back on the Anglo-Allied right, Ney continued to drive Kellerman's heavy cavalry against the Anglo-Allied position as Foy's division moved up into the gap left by Jérôme's men and the attack on the right-centre continued to gain ground. 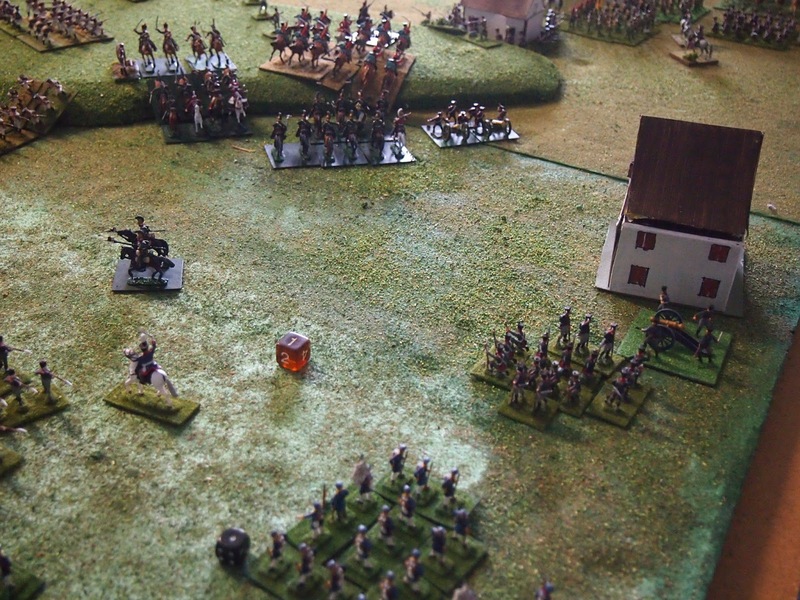 Ompteda's KGL were really feeling the heat in a burning La Haie Sainte that was now almost completely surrounded by Frenchmen. 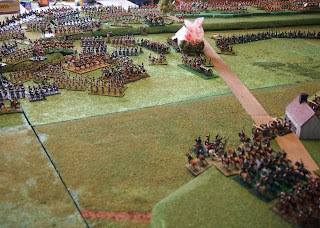 and the opposite view from the 'west'. 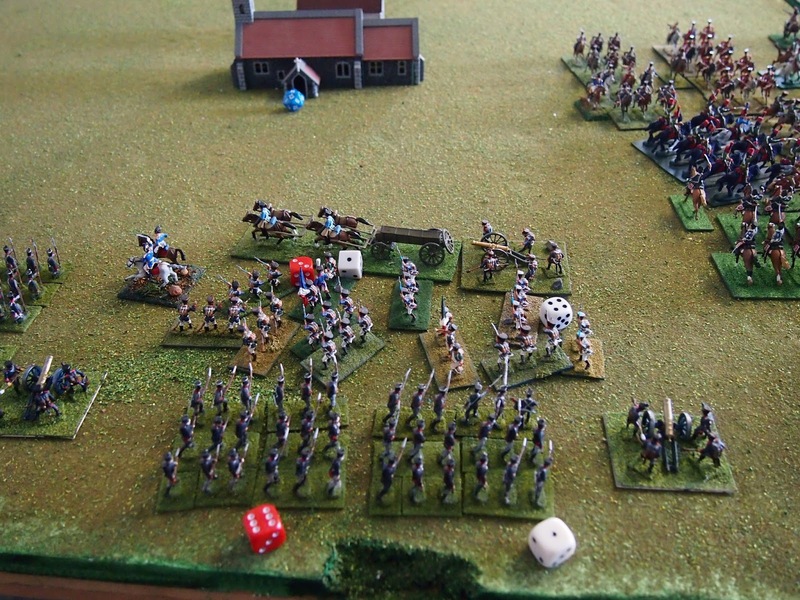 Cavalry action abounded, with mixed results for both sides. but Arentschild's 13th light dragoons fought off d'Hurbal's 3e cuirassiers. 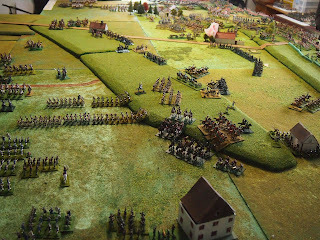 as Domon's chasseurs à cheval attacked in support of Simmer and Jeanin's divisions of Lobau's corps. Delort's 10e cuirassiers were worsted by 11th light dragoons. 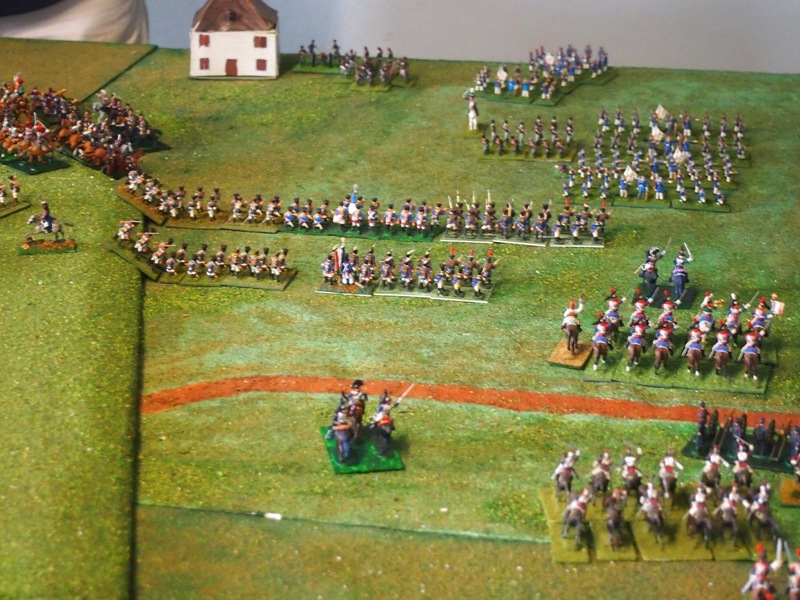 In a shock result, a volley from the 1/3rd Silesian Landwehr stopped Durutte's 2/95e line and then they beat off Wathier's 1e cuirassiers! Jacquinot's 3e chasseurs à cheval continued their losing way, this time against the 2/18th Infantry Regiment (6th Reserve). 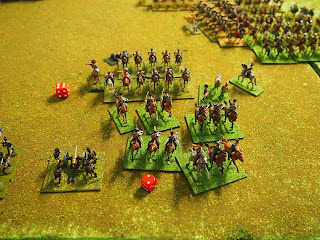 von Schwerin's 10th (1st Magdeburg) hussar were less successful agains the previously triumphant 4e cuirassiers and chasseurs à cheval de la garde, supported by the 7e cuirassiers. only to be halted in an attempted breakthrough onto von Sydow's 12th reitende batterie. The Prussian attack was gaining some momentum. 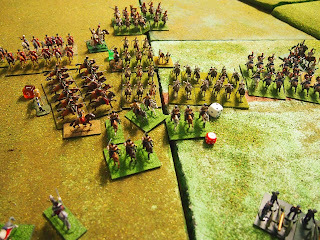 French stocks were not aided by the loss of Delort's cuirassier division, effectively ending the attack on the Anglo-Allied left. 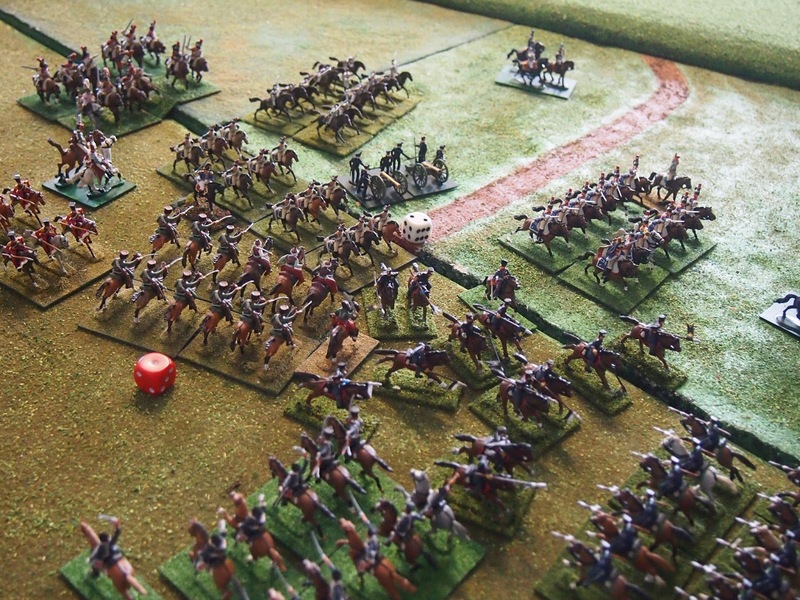 The 3rd Silesian landwehr cavalry were no more successful than their countrymen against the hard-pressed chasseurs à cheval de la garde. The Red Lancers failed against the 8th (1st Westphalian) hussar; not learning about those ones...! 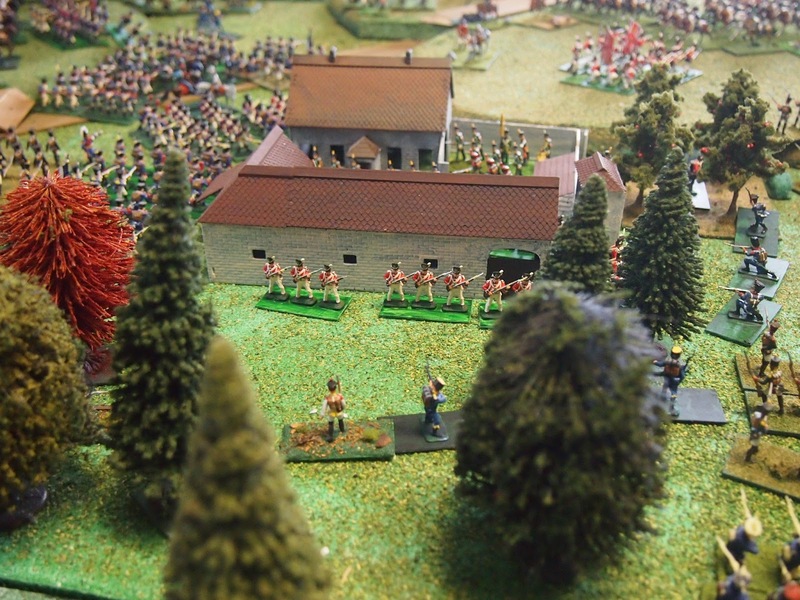 The second chasseurs à cheval were more successful against Hiller's 3/15th Infantry Regiment (3rd Reserve). 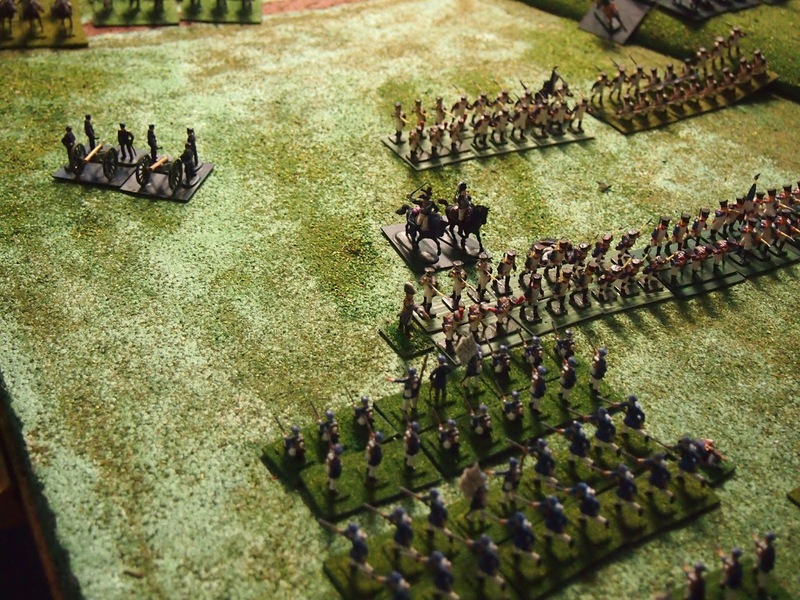 Durutte's men continued to hold their ground, their flank supported by Wathier's horsemen, but the Prussian reserve artillery were now deployed (centre-left of photo). The Prince of Orange ordered Hussey's hussars forward. 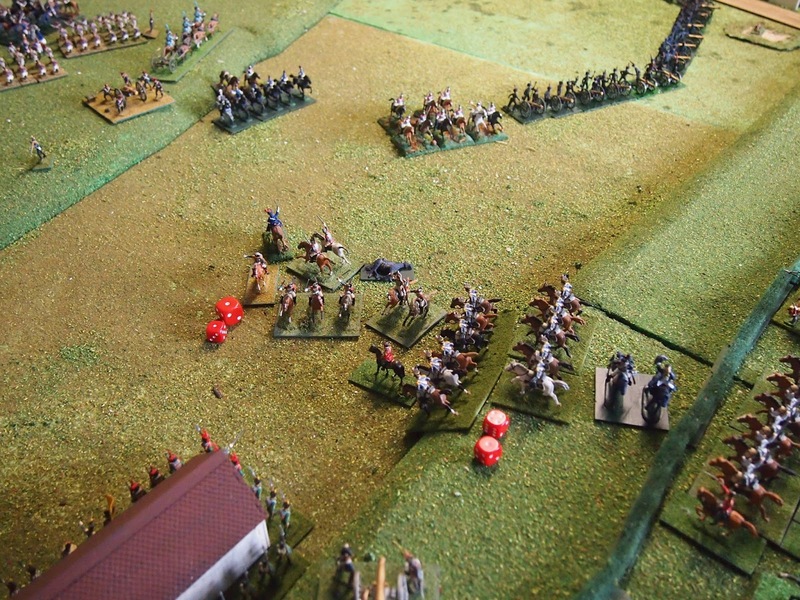 The infantry of Jeanin's, Simmer's and Foy's divisions were now united on the ridge-line, having driven off Byng's guards. The Guard were finally on the move, Middle in the centre of the photo, Old at the bottom and the Young Guard at the right heading for Plancenoit. 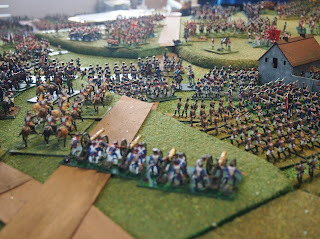 Let's conclude with a some photos from either end of the table. 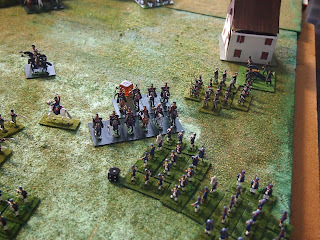 Was this the 'high tide' mark of the French attacks, or was the Anglo-Allied line about to break? 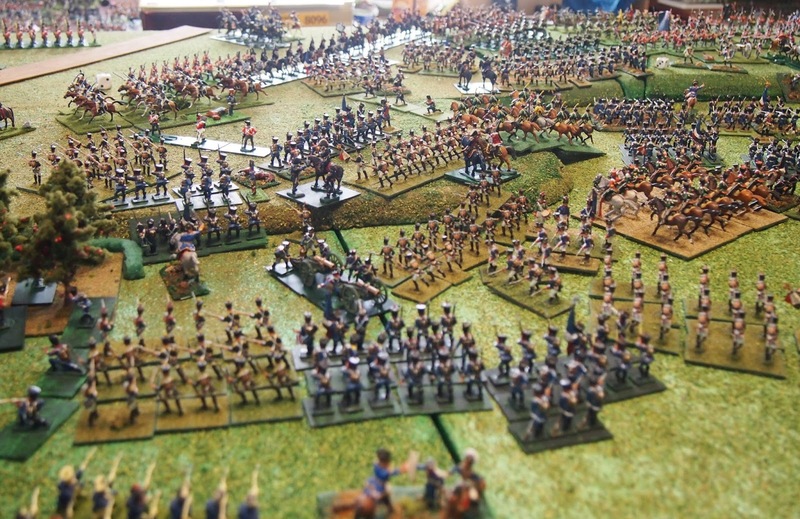 Would the French attack run out of 'puff'? 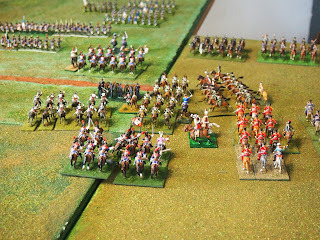 Will the combined force of the Young Guard, supported by guard light cavalry and Wathier's cuirassiers be sufficient to assist Durutte's division in holding the French right? Have the guard moved too late to be part of the decision? 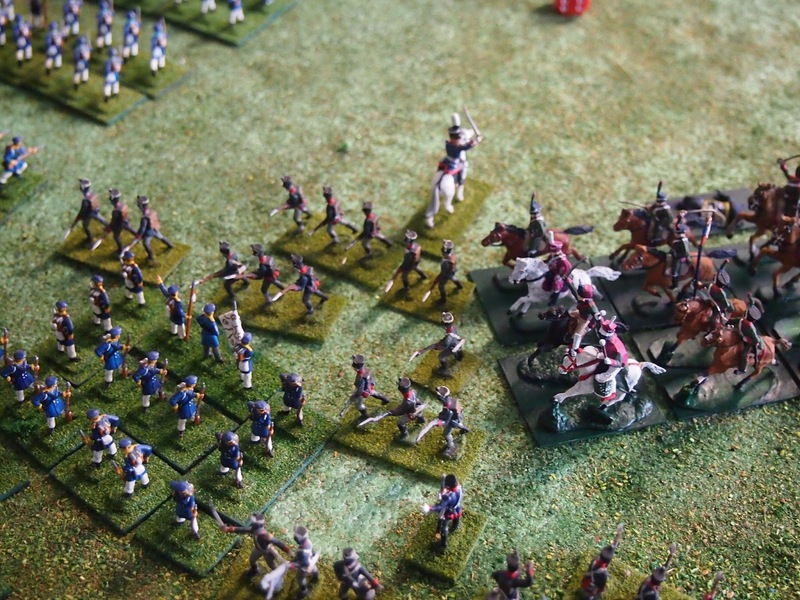 These questions were answered when we played the fourth and final part of the game on 15th August 2015. 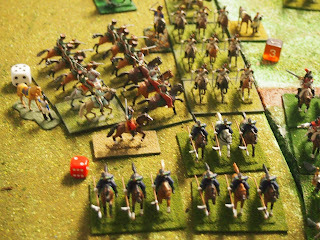 Report to follow soon! 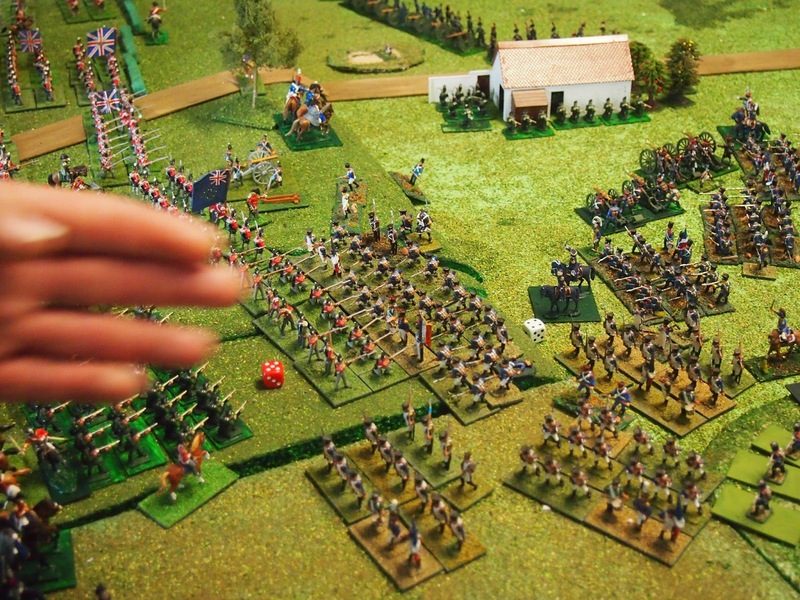 Truly magnificent in scope, execution, and narration, James! 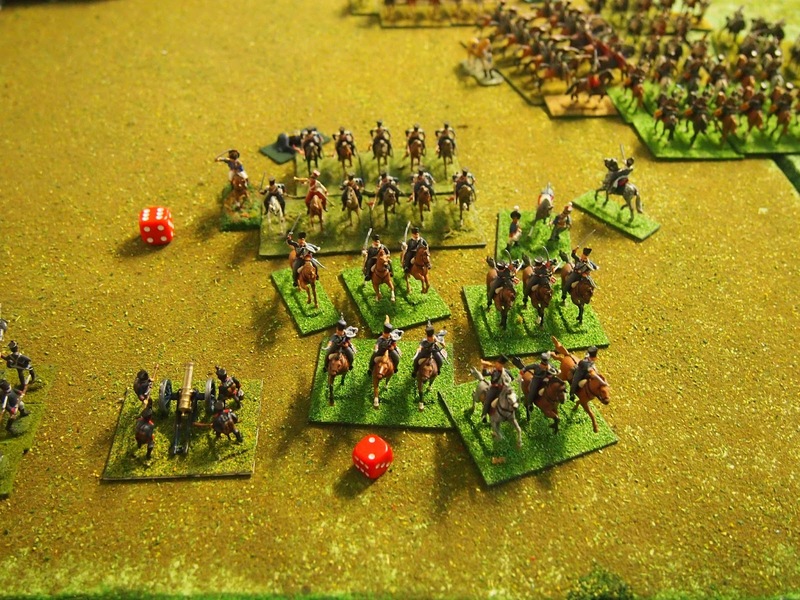 Ah yes, having Russian dragoons in a cuirassier/chasseur sandwich... we've had some similar experiences haven't we?! Looks like a fantastic game James - can't wait to see what the Guard can do! 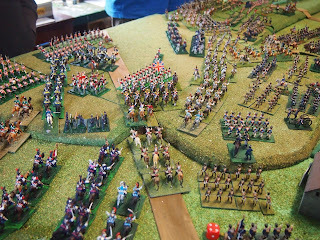 A few surprises await you in part four Ian. It was an epic game--at least we think so! 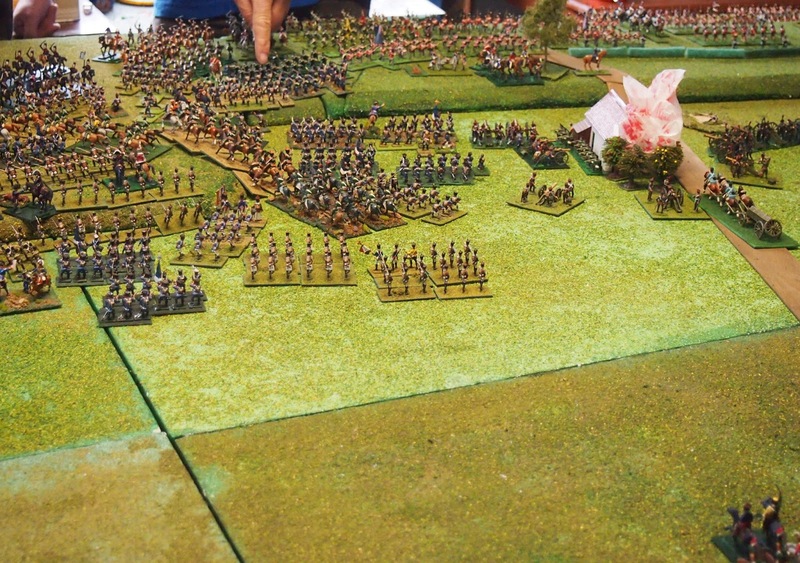 A fight on an epic scale! 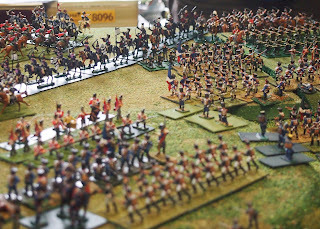 So many troops packed onto the table. 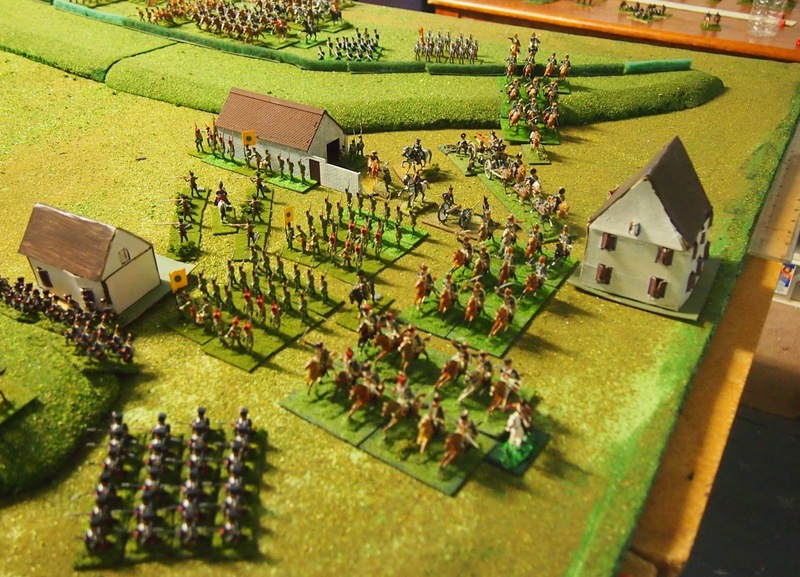 Marvelous sight! 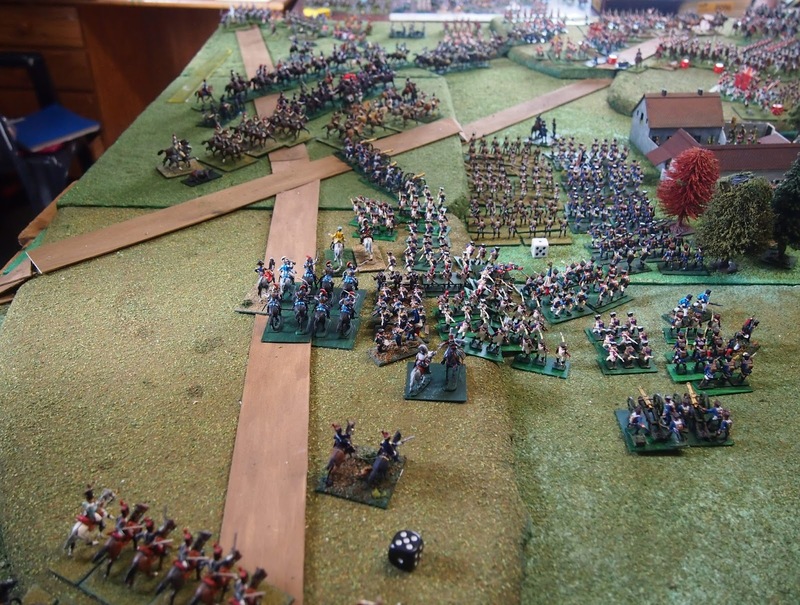 Awesome sight James! 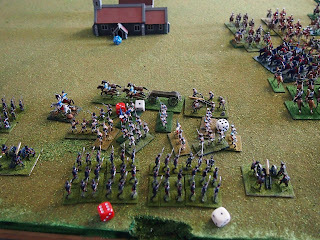 Looking forward to part 4 now! 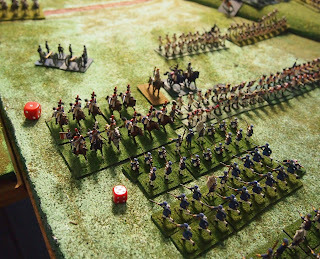 The pressure, the pressure... ha ha!! 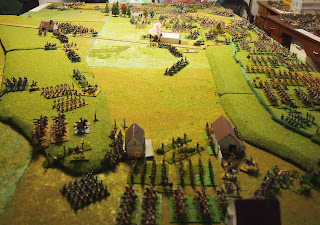 It's in preparation! Excellent post - I had missed most of the action on the Allied right. Yeah, it was difficult to keep up, wasn't it? That's why I kept going down the other end to keep up with events and take some photos.